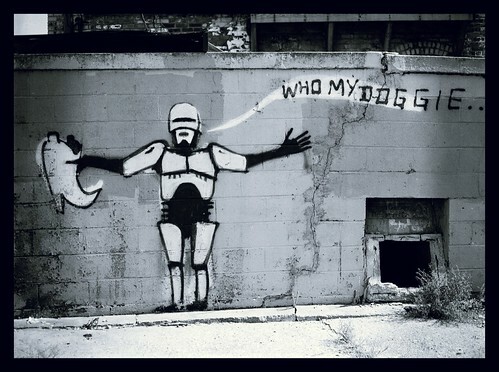 Robocop's Doggie, a photo by Andy_Tanguay on Flickr. The quality of graffiti in Detroit is simply fantastic. This was behind a little store off of Michigan Avenue in Corktown. Not really even out in the open...sort of a warm up for somebody. Who amongst us hasn't thought of themselves as Robocop holding a cowboy boot and wonder who's their doggie? Really speaks to the average joe.